Hello, everyone. 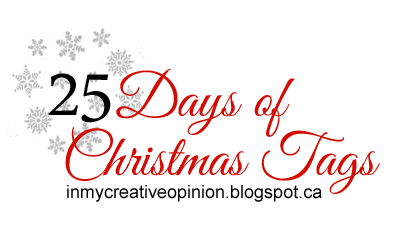 I’m happy to join to the great event – Tracey McNeely’s 7th annual 25 Days of Christmas Tags, a link up to play along, and of course, prizes! You can read all the details HERE. 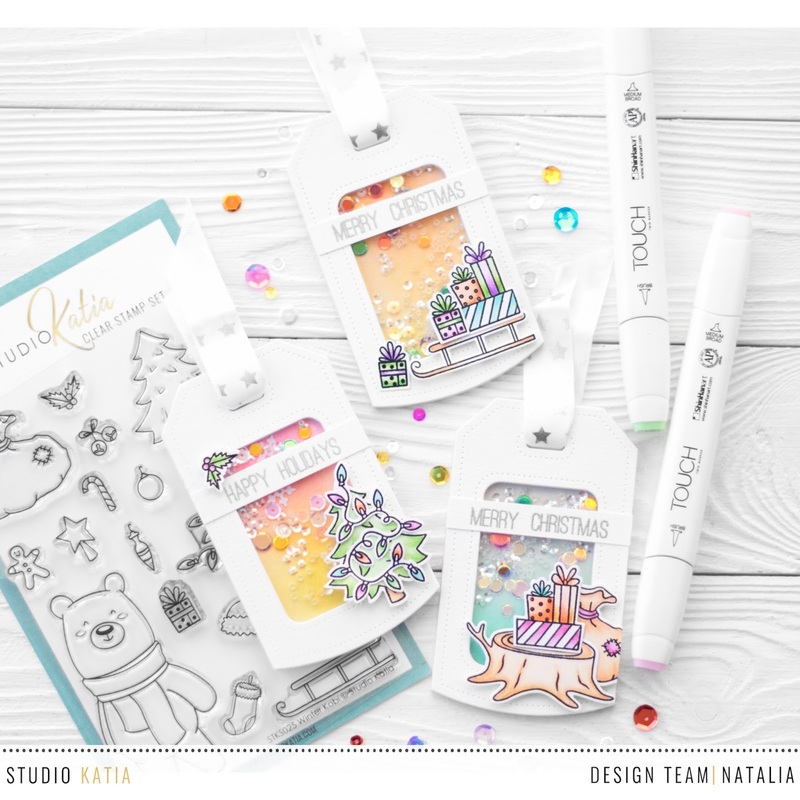 Today I would like to share Christmas Tags, which I made for Studio Katia’s day. I like shakers so much, that making tags is one more reason to make little sweet shakers. First of all I cut workpieces using Dotted Shaker Tag die 1. Lower part (without the window) I toned with Distress inks. 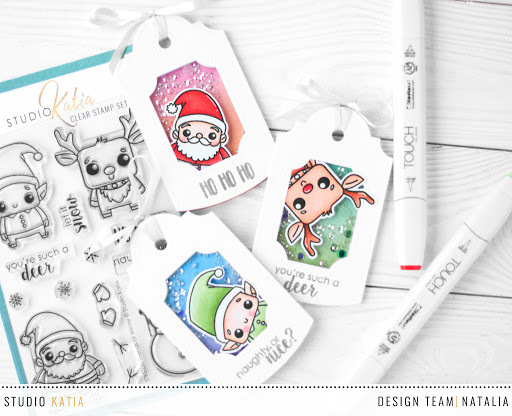 Then stamped elements from Winter Kobi set and colored them using Touch Twin alcohol markers. After it, using coordinating dies, I cut all the elements. Next, I stamped sentiments from Pink Winter set on white cardstock, using silver embossing. Filled the windows with: 3MM Majestic Sequins; Clear Dust Seed Beads; Snowflakes; Crystal Clear Confetti; Crystal Rainbow Confetti; Majestic Confetti. I glued cover to each tag, all cut elements I put on washy tape, stuck the banner with sentiment above and satisfied with the work done. 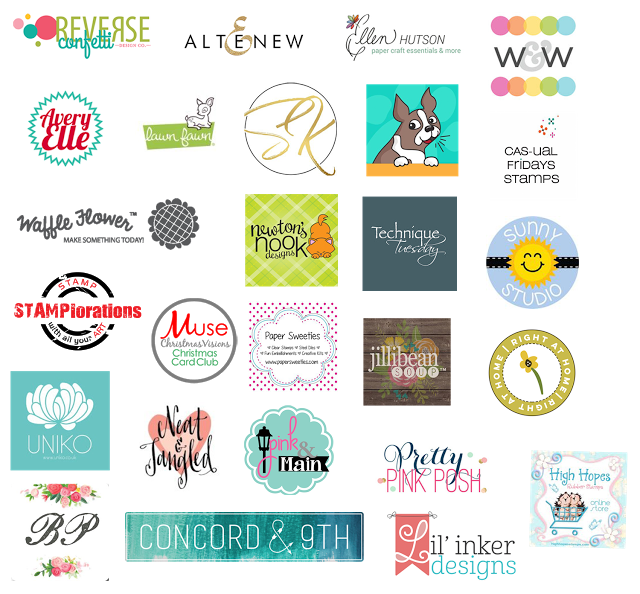 Here is a peek at some of the awesome sponsors for this event! Hello, everyone. Natalia is here. 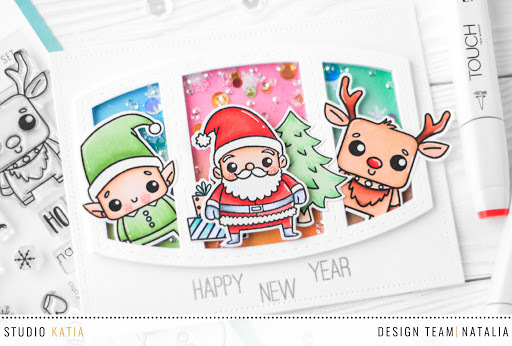 Today I will show my Christmas tags in the framework of the theme week. And, of course, the card in the same thematic. There was no question for me, what tags I’ll make, I knew it will be shakers. Also I knew the heroes of my tags. 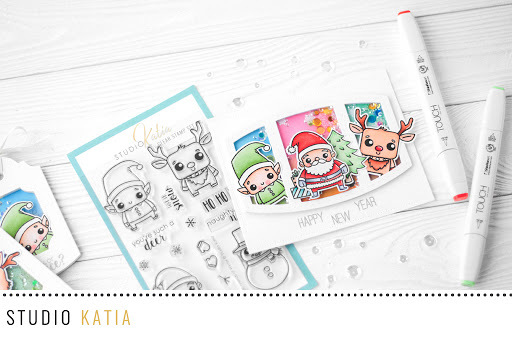 I took the set I’ve never work with before – Friends of winter (because of this cuties I decide to make optional card – just couldn’t stop). 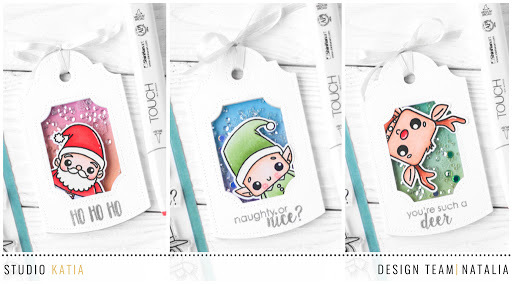 I stamped Friends of winter with Memento inks and colored them with Touch Twin and Copic Scetch alcohol markers. Then I cut them with coordinating dies. Next, I made workpieces, using Dotted Shaker Tag. 2 or 3 workpieces with windows and 3 without. Inner part (without window) I toned with Distress inks, according to colors of the character. After that, I cut 3 workpieces with window for each tag from very dense cardstock which gave volume to the shaker. I stuck all workpieces together and glued to the base with adhesive tape. After that, I filled shaker with 3MM Majestic Sequins and Clear Dust Seed Beads – this sets I put almost in every of my shakers. Also I put: Snowflakes; Crystal Rainbow Confetti; Crystal Clear Confetti; Majestic Confetti. On cover of shaker I stamped sentiments, suitable to each character, using silver embossing. Under cover I stuck transparent plastic and glued everything together. Such beautiful result we have in the end. Now shortly about the card. I made it, inspired by tags, to have the set. As I always do 2 workpieces to 1 stamp (in a case of fatality), I have got beloved trio. Additionally I stamped Christmas tree and gifts from Winter Kobi set, using Memento inks. Colored with Copic Scetch and Touch Twin alcohol markers. 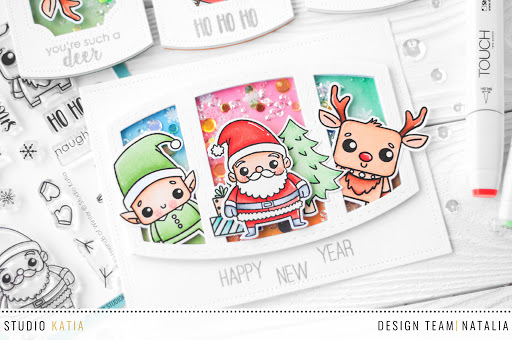 Cut everything with coordinating dies. I’ve been thinking for a long time what die to take for central composition, because the characters are quite big. I stopped at one of my favorite dies – Stitched Creative Window. I took frame die from Darling Ribbon & Dotted Frames and cut the base with it. Then, using Distress inks, I toned places for windows. White embossed snowflakes took place in windows. Silver embossed sentiment I made with Origami Winter set. As it was with tags, I cut 3 workpieces from dense cardstock, using Stitched Creative Window die to add volume for shaker. Stuck all together with adhesive tape. Filled the windows with: 3MM Majestic Sequins; Clear Dust Seed Beads; Snowflakes; Crystal Clear Confetti; Crystal Rainbow Confetti; Majestic Confetti. Stuck shaker together and glued it to the base. Stuck elf and deer on adhesive tape such, as if they look out of the window. In the middle window I stuck Christmas tree and gifts, on top of it I stuck Santa on washy tape and voila, card is done.